This recipe is from 1847 Stone Milling, our new local supplier of cold stone milled organic flour. 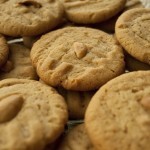 We have rye flour so thought you might like to try this peanut butter rye cookie recipe. Preheat oven to 350 degrees. Line a cookie sheet with parchment paper In a small bowl mix flour, soda and salt. Set aside. Blend melted butter, peanut butter, sugars, egg and vanilla. Add flour mixture and mix well. Place cookies on a cookie sheet. Bake for approximately 10 minutes until lightly golden brown Enjoy! !